Chuckit! Flying Squirrel is one squirrel that does not mind being chased! Grab one of its paws and throw him like a flying disc, watching his feet spin quickly in the air and providing great entertainment for you and your dog. The Chuckit! 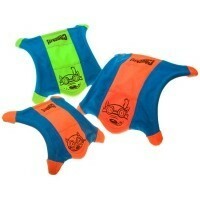 Flying Squirrel has durable rubber feet for floatation in water, glow in the dark paws and raised sides for an easy pick up! Offering a number of beneficial features, this Frisbee is one of the best on the market! Made of rugged nylon and designed not to affect your dog’s teeth!